Anxiety and fear seem to be everywhere we look, everywhere except on the faces of the Saints. 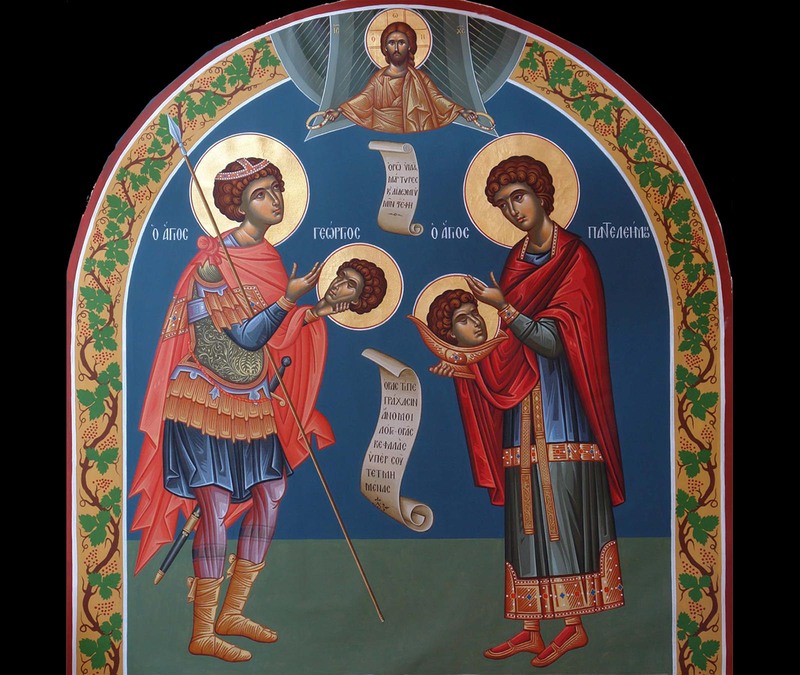 Sacred Icons of the Martyrs even during their martyrdom have not a trace of fear or anxiety. Why is fear and anxiety so present in our world and so absent in a world of genuine and proven holiness? Father John Romanides provides an answer from the position of Orthodox anthropology: “While the brain is the center of human adaptation to the environment, the noetic faculty in the heart is the primary organ for communion with God. The fall of man or the state of inherited sin is: a) the failure of the noetic faculty to function properly, or to function at all; b) its confusion with the functions of the brain and the body in general; and c) its resulting enslavement to the environment.” We are anxious and fearful to the extent that we are enslaved to our often, uncontrollable environment. And we are enslaved to our surroundings to the extent that we are not in communion with God Who is both absolutely beyond and ineffably present in our environment. Just as physical life is impossible if the lungs cannot breathe in oxygen and if the heart cannot circulate that oxygen throughout the body, so spiritual life is not possible without the nous breathing and circulating the oxygen of prayer in an analogous way. And just as medical science has uncovered the symptoms of lung disease and heart disease that reveal an underlying dangerous condition, so the fathers have discovered the symptoms of the spiritual disease of the noetic faculty. Again, Father John Romanides writes, “The patristic tradition is aware of the existence in human beings of a now normally non-functioning or sub-functioning memory in the heart, which when put into action via noetic prayer, includes unceasing memory of God and, therefore, the normalization of all other relations. When the noetic faculty is not functioning properly, man is enslaved to fear and anxiety and his relations to others are essentially utilitarian. Thus, the root cause of all abnormal relations between God and man and among men is that fallen man, i.e., man with a malfunctioning noetic faculty, uses God, his fellow man, and nature for his own understanding of security and happiness.” According to the fathers, fear and anxiety demonstrate that a human being is not in continuous contact with God. When the nous functions properly, the spiritual heart cries, “Abba, Father” with the same regularity with which the physical heart beats and the lungs breathe, for the soul needs the Lord Jesus to touch her just as often as the heart and lungs need oxygen. It is not possible to fear and be anxious as long as one is in the perfectly safe and secure presence of the most merciful, humble, and compassionate Christ. But it is also not possible to remain in that presence, unless the noetic faculty functions properly through unceasing prayer. Outside of that blessed presence, people seek security elsewhere with the desperation of those suffocating in a smoky room, looking for just a window to bring in some fresh air. In need of security, people then use others, including God Himself, in a selfish, egocentric way. And being egocentric, viewing everything exclusively from the perspective of me means that my imagination begins to swell and to work to find security and happiness in all the wrong places. And so, “ Man outside of glorification imagines the existence of god or gods which are psychological projections of his need for security and happiness.” Fearful anxiety comes from musing on dangers in the past and projecting them into the future. It takes us out of the present moment. But it is the present moment in which the heart must beat, the lungs must breathe, and the nous must function through the constant and abiding remembrance of God. In a 1937 sermon offered to his flock in Shanghai, Saint John Maximovitch reminds his children that, “nothing is fearful to him who relies on God.” And this reliance comes only through prayer without ceasing. We all have a spiritual heart that we can strive to discover through simple repentance and by calling upon the name of our Lord. It will take time for our fears, anxieties, and imaginings to weaken. Remembering God, remaining in the present, vigilantly guarding the heart against the “terrors of the night” by trust in God will help. Love, we are reminded in Scripture, casts out all fear. Love that is not selfish, but given wholly over to God, does not have the mental space to give itself over to fear. As I mentioned in a previous blog post, “So too, in our own lives, Jesus is not to be found in death (fear). “He is not here.” He has overcome death and cast out all fear, trampling down death by death. Whatever we fear, whomever we fear has been conquered by the glory of the Cross and Resurrection. If we have fear ever dwelling in our hearts, we are harming our physical, mental, and spiritual health. Neuroscience, psychiatry, and the Gospel agree on this point. Such fear is certainly not of God. Such fear keeps us chained to illusory and deceptive thoughts that alienate us from God and one another. Yet, that chain has been broken, Satan has been conquered, fear has been overcome. We need only recognize this and be glad in Him who has made us a new creation. Lord Jesus Christ have mercy on me. Glory to Thee, O God, glory to Thee! Amen. Thank you for your wise words. I find that when my heart is prayerful all of life’s difficulties are easier to bear. The exact opposite is true, that when my heart is cold towards prayer, this is the time I find most difficult. In what book do the quotes from Romanides occur? I would love to read them in context. Thanks for your blog. It is a blessing. The Lord God bless you Miladin! Yes, prayer in the heart is the most trustworthy barometer for how we will be able to go through any difficulty. With prayer present, all does become easier indeed! I am from Bulgaria, finished psychology and have written to You before. In the morning in bed I have many anxious, depressive and aggressive thoughts. I felt that 26 psalm said many times helps me! I feel the trust in God like an attitude of heart , inner feeling not even prayer, but opening the heart to God, feeling of giving of all cares to Him! I feel that diffren kinds of my own prayers help me most – thanksgiving, hope, humble thoughts, suurending to God s will. I want to find the way to fear of God, whitch gives wareness and hope that gives calmness. I want to develop every minute alive hope in God. I want to live in Hope and surrender to God and prayer. I think that sometimes, because I do not have enough hope, trying to remember death and trying to be humble, the devil leads me to depression. I had the impuls to write this to You. It important to me. Is this feeling of Hope right? How to develop fear of God whiches healthy and real, not false feeling created by me?Bless me and have me in Your prayers! I have many problems with work and may me neurological promlems! Bless me and forgive me! May the Lord God bless you, Ventseslav! Yes, it is certainly good to have feelings of hope, hope in Christ, hope that Christ will accomplish the miracle of our salvation as He did for so many and continued to do so throughout all time. Humility and the remembrance of death can lead to depression only when they are separated from the source that gives them their true meaning. In other words, we know that Christ clothed Himself with humility, so in humbling ourselves we are drawing nearer to Christ. Likewise, the remembrance of death is not meant to fill us with gloomy thoughts that it is all over, but with the thought that it is about the begin, that time where we hope to see the face of God and the joyous countenances of all those who love Him and rejoice in Him. Remembrance of death and humility should both fill us with hope, for they are the very limits of human existence in which we can find God in a way that is extremely real. The focus, though, always needs to be, not even on this virtue or that, not on this spiritual practice or that, but on Christ, on loving Christ, on living in Christ, on living for Christ, on being with Christ. Then, dying in Christ becomes the greatest joy, being humble in Christ the greatest honor, and placing our hope in Christ, the most natural response of the human heart.